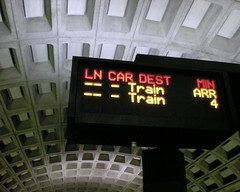 Some good news out of the Post this morning: Metro’s going to shakeup their management. It’s from Jim Graham himself that the word comes to the Post, so there’s a solid chance that it’s happening, but it’s not clear what a reorganized Metro would look like. It’s suspected that John Catoe will survive the maneuvers, which I think is a tremendous mistake. Reorganizing Metro with Catoe at the helm is a classic example of rearranging the deckchairs on the Titanic.